Am I able to use the aerial cable to run the C64 and if not, how do I find a C64 out to S-Video cable? I don't feel comfortable making one. The VIC-II chip inside the C64 computer outputs a S-Video signal, which is mixed and modulated into the matal box that contains the UHF modulator circuit. Earlier models made composite video available on the A/V DIN connector. Later models also made separate componentes (luminance and chrominance) available as well. For the sake of image quality, and as you say you want to use your C64 in a modern TV, it's better to forget about the UHF output. Most modern TVs still have a composite video input (yellow, white and red RCA connectors at the back). If yours doesn't have it, it may have it in form of a TRRS output and you will need a cheap TRRS -> RCA converter. 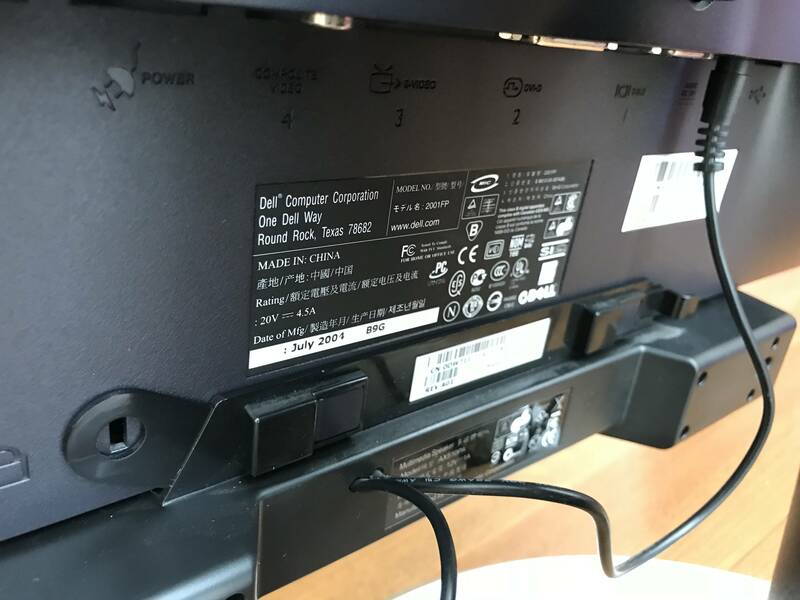 Others have it embbeded into the SCART connector. Others share the composite video connector with the YPbPr (video component) connector (actually using the Y connector (green) for both luminance and composite video). So, your first and more succesful option would be to get a composite video signal and audio signal from the C64 A/V DIN connector and feed with it your TV. However, if you find your TV supports S-Video (normally, a 4 pole mini-DIN connector) and your C64 is a later model that outputs S-Video, then you can try it as well, for a slighly better video output. Or this one, if you can confirm your TV supports S-Video input and your C64 can output it as well. 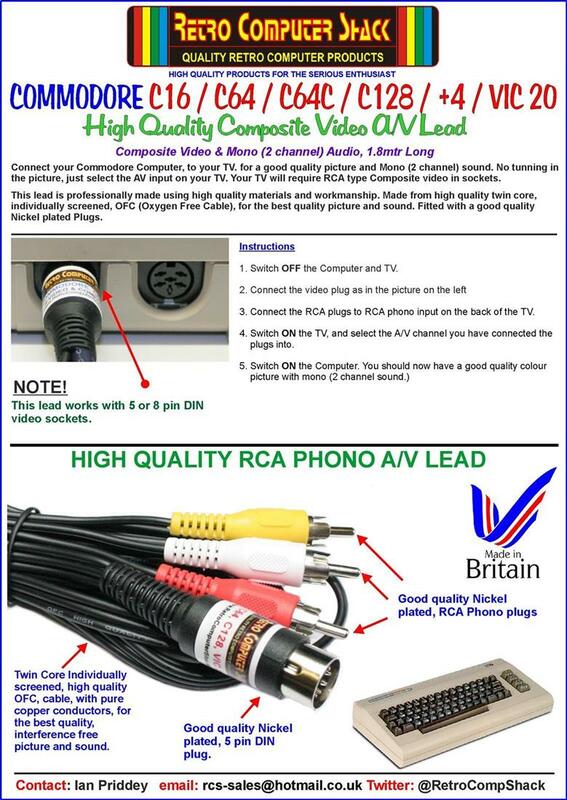 Note that this cable can also be used with older C64 computers / TVs which supports only composite video. If (and only if) your target monitor doesn't accept either composite video or S-Video, then you can try a converter box. This one I bought some time ago can accept both composite and S-Video inputs. 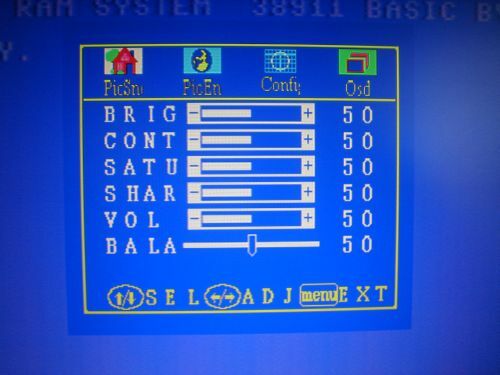 This is how I see a C64 computer in my TFT monitor. Its monitor OSD shows me which VGA output resolution I'm using. Although it is using the composite output from the C64, I think it gives a very decent image. 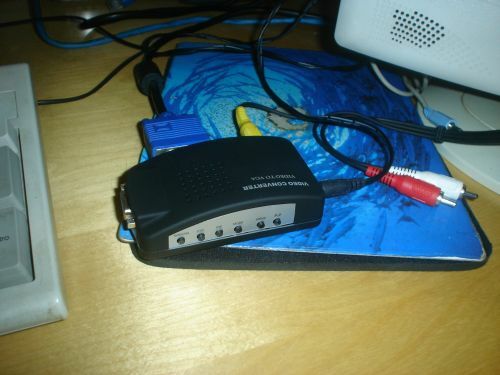 This particular VGA converter box allows a VGA source too, so you can share your mnitor with your PC and your C64 without the tedious connector unpluging and pluging. Just pressing a button. You can even have a PIP (picture in picture) output. Of course, you can go for a composite-to-HDMI, or S-Video-to-HDMI converter box, if you are willing to use a monitor/TV without VGA input. Amazon sells them with different prices and options. 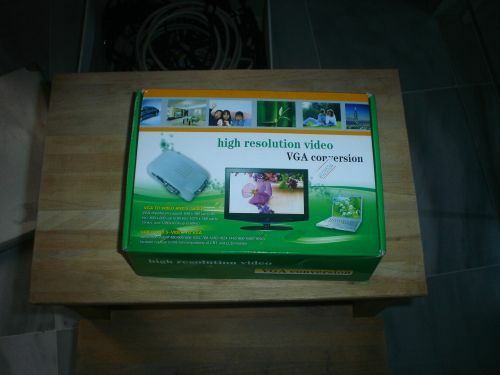 These HDMI converters usually convert the audio signal also, so you have a true HDMI audio/video signal. I have one such converter, but I haven't tried it yet with a C64. You can use the aerial port on your TV, but you probably need a switch box for that to work. Every C64 came with the cable and switch box in the box but they are infrequently used today because the picture quality is the lowest. The C64-to-S-Video adapters are available on eBay. You need a C64 monitor cable to plug into it. 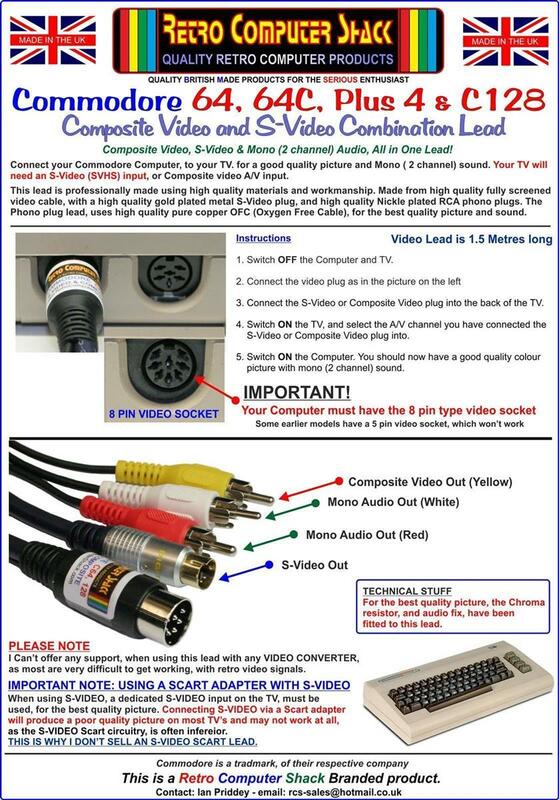 Converting composite or S-Video to VGA is more complicated but there are devices which can do it. 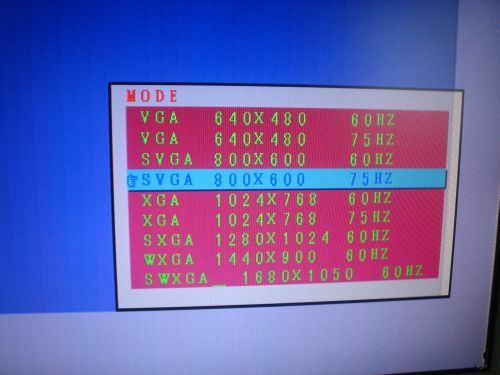 There is a popular one called the GBS-8220, also available on eBay, that can convert composite/YUV and CGA/EGA/RGB to VGA. I don't know what your budget is, but if you can afford it then consider a C128 and old RGBI-compatible monitor instead. It will still "look cool" and allow you to "program with limitations". You will gain a crisp 80-column display, ability to program for both the 6502 and z-80 CPUs, and a much better built-in BASIC. BTW, RGBi stands for Red, Green, Blue, intensity. It was a digital signal providing for 16 sharp colors, 4 bits for each pixel. They were black (no bits set), light grey (R+G+B bits set), red, green, blue, cyan (B+G), magenta (R+B), and yellow (G+R). Each of those base 8 colors had an enhanced intensity when the i-bit was set. Among everything else, this turned light-grey to white, and black to dark-grey. I used my C128 with a Sears Total Video System. 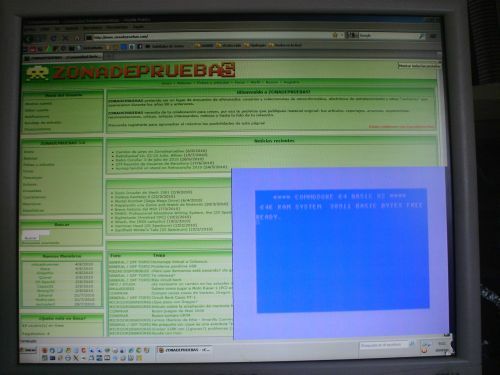 It combined a TV and monitor modes for monochrome, composite, and RGBI. This was perfect for the C128 because the composite worked with C64 mode and the RGBI worked with the C128 modes. (Plus it was my TV.) Here is a 1985 article which includes descriptions of the Sears TVS as well as other flexible monitors of the period. If you wish to avoid buying an old separate monitor/TV, see this article for building an RGBI to VGA converter. Sigh, it looks like your TV doesn't have VGA either. However, this should hook up to just about any computer monitor you happen to have. I use a pre-July2005 Dell 2001FP and it works really well. S-video input, 4:3 aspect ratio, and best of all integrated amplified audio speakers. The integrated soundbar (optional) has a 3.5mm jack, so you'll need to adapt the C64 8-pin DIN mono audio-out to that jack. I like integrated speakers so there's less clutter on the desk. And since the C64 has such great games, the audio has to be good quality. With onboard power, there's even less clutter (no AC-DC power adapter to plug into the wall and sit on the desk). 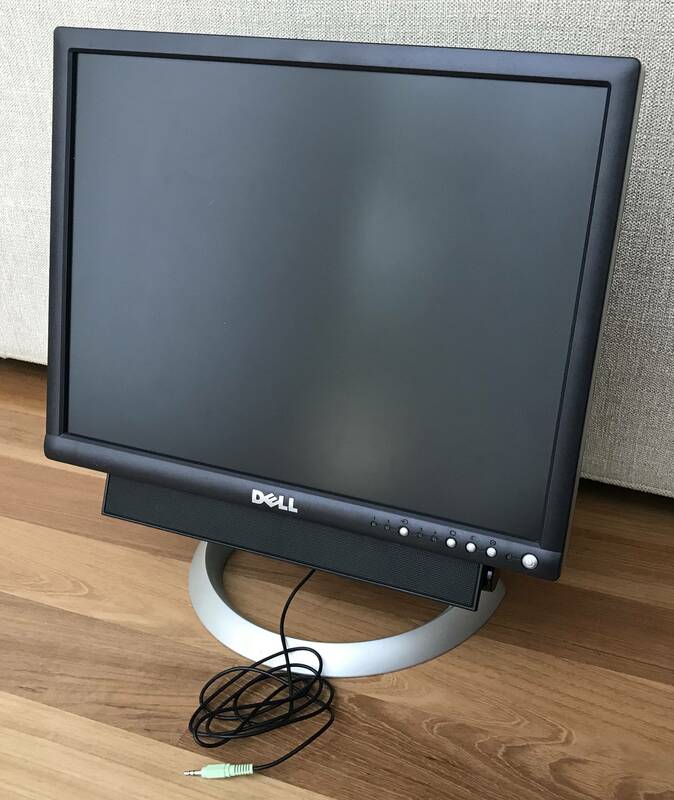 A lot of Dell monitors look like the 2001FP, but most do not have all the ports of the 2001FP. 2x USB-A, 1x USB-B, 12V DC out for soundbar, analog VGA, digital DVI, S-Video, Composite. The right-most port is power-in to power the 2001FP. 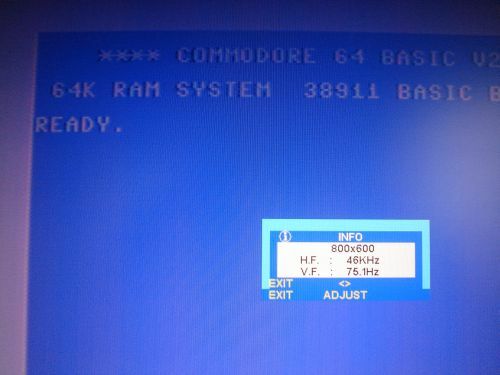 How can I overclock my Commodore 64?